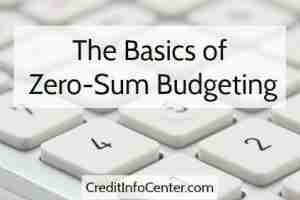 In a sense, zero-sum budgeting means spending every dollar you make. What makes it work is “spending” your money on savings and paying down debt (critical during the credit repair process). The point is, you don’t want extra money just sitting around in your bank account waiting for you to decide what to do with it. Doing that implies you have money leftover to spend on whatever, and that whatever is often unhelpful spending that gets you nowhere fast. Track your spending for a couple of months. This is the only surefire way to see where you’re spending more than you’d like to (e.g., clothes, eating out), and where you’d like to spend more (e.g., paying down debt, savings). You may think you have a general idea of where your money goes. Well, don’t take it for granted. As just about anyone who has tracked their spending can tell you, there’s always an element of surprise, if not downright shock. Make a list of spending categories. Include all of the usual suspects in your spending categories, like the house payment, utilities, car payment, car maintenance, insurance, cell phone, entertainment, gifts, paying down debt, savings, etc. Use this category system to add up the spending you do over your tracking months, during which time you may discover new categories that need to be added to the list. Whether you’re spending more than you make, or in ways you’d rather not, this is where you start making adjustments. Use your final master category list to add up what you’ve been spending every month and rearranging these dollar amounts as you see fit. Use this month’s income for next month’s expenses. This is an easy one if your income is the same every month. But it’s also helpful if your income fluctuates. Basing what you spend next month on this month’s income makes it easier to ensure you don’t spend more than you make. Of course, a fluctuating income also means making adjustments all the time. If what you make this month is less than usual, for example, then what you spend next month will have to be lessened to reflect that. Save up a month’s worth of expenses. It’s impossible to pay next month’s expenses with this month’s income if you’ve already spent this month’s income. Maybe you already have enough saved up to start your zero-sum budget today. If not, you’ll need to save a month’s worth of expenses first. As soon as you have a month’s worth saved, use that amount to determine next month’s spending. Then use next month’s income to determine the following month’s spending, and so on. In this way, you’ll always be a month ahead of your finances. That’s not just smart; it feels good, too. Learn more about budgeting and saving.